Staff retention is a challenge in the retail sector because retailers generally don’t have succession and progression programmes in place at every level of the business. According to a recent survey, 40% of employees who receive poor or no job training leave their positions within the first year. The industry also presents a difficult training environment for many reasons. The first is a lack of a dedicated space and the second is scheduling the time for training during working hours. Space is dependent on the what certain branches have available and training across the company becomes increasingly difficult the further branches are geographically spread out from each other. Employees also work in shifts, which makes it difficult for everyone to be together for training. 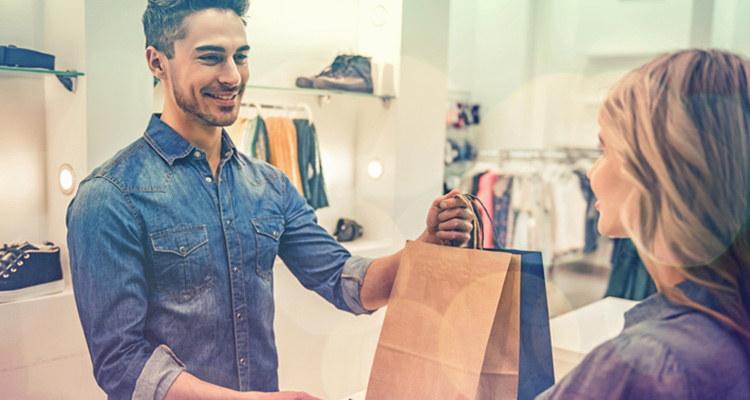 These issues pose serious hurdles as retailers rely on building strong brand identities, especially through the service of well-trained retail employees. This is where interactive video training can offer a solution to a multi-faceted problem. The concept of the interactive video is similar to the ‘choose your own adventure’ books which we all loved as children. It allows the learner to become immersed in a story as it unfolds and control what happens through a series of choices, taking them to different outcomes which are based on those choices. This helps learners to understand the consequences of their actions as though they are dealing with real customers and situations but in a safe and forgiving environment. In the retail industry, for instance, you could welcome a customer coming into the store to speak to the manager, but the manager is currently off-site. What do you do? Tell them the manager isn’t available and they should come back later? Tell them the manager isn’t available but they are welcome to speak to you? Ignore them and allow another employee to deal with the problem? The concept of the interactive video is similar to the ‘choose your own adventure’ books which we all read and loved as children. When you click on a hotspot within an interactive video, you are able to interact with the object or person or receive additional information about a product or service. The ‘choose your own view’ option allows the learner to see things from the perspectives of different people or from various camera angles – this ensures that no two viewer experiences are the same. The most commonly used interactive video type is the branching scenarios method, which we discussed earlier. This is where the user makes choices based on their own experiences and what they have learned in the course. Their choices will determine the outcome of the video – different choices mean different outcomes. The scenario-based interactive video offers the retail industry effective cross-branch training, without losing time on the sales floor. Training can be almost instantly available to learners, and can still take place outside of regular working hours, diminishing the risk of reduced productivity and increasing staff retention and your bottom line.